Experimental and theoretical researches to develop the scientific and technical abilities for the realization of quantum networks with applications to the distribution and processing of quantum information. It includes the development of light-matter interfaces for quantum data storage and processing, the characterization and manipulation of various non-classical states of light, and the implementation of networking protocols using these resources. 2005-2007 : Postdoctoral Scholar at Caltech, in H.J. Kimble group, Marie Curie fellow. Light-matter interaction at the quantum level by interfacing atomic ensembles and single photons. First demonstrations of rudimentary networks based on DLCZ. 2004-2005 : Postdoctoral Scholar at Insitut d’Optique-Graduate School, in Ph. Grangier group. Optical Schrödinger cat states for quantum information processing. 2001-2004 : PhD in Quantum Optics at Laboratoire Kastler Brossel, under the supervision of Prof. C. Fabre. In charge of a L3 training program in Optronics. The students are half-time studying at the university and half-time working as apprentice in a company. Elected as "University Golden Nugget" in 2014. 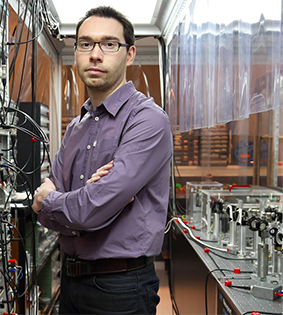 2008-2013 : Member of the Physics Department board, in charge of infrastructures. Phys. Rev. Lett. 107, 050504 (2011) ?